Photographic blog showcasing the newest and cutest baby animals from zoos and aquariums around the world. It is maintained by two people Chris and Andrew. Written by blogger Darren Naish, Tetrapod Zoology focusses on sharing information related to Amphibians, reptiles, birds and mammals – living and extinct with special interest to dinosaurs. All the latest breaking news on animals and zoos. Animal World’s blog features everything from the land to the sea and specializes in pet care. Along with pets, you can learn new things about exotic animals as well. A group of bloggers committed to deliver news related to ocean science from a scientific view point. 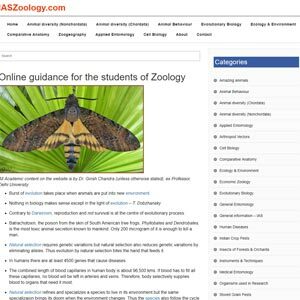 Maintained by veteran Professor Dr. Girish Chandra, IAS Zoology is a website for any student studying Zoology. With well-arranged topics and categories, there is endless material needed for any zoology student. Maintained by Joseph Jameson-Gould, this blog explores a collection of weird, ugly and monstrous members of the natural world, creatures strange in body or habit. A blog about birds, pictures of birds, and people who write about birds, birding, conservation, and much more. A blog highlighting, discussing and critiquing the science of biodiversity conservation. Maintained by CJA Bradshaw, this blog goes a step deeper with conservation research. Written by John Simpson Wilkins, this blog shares thoughts on evolution, science, and philosophy. Primatology is a blog run by a group of volunteers interested in the research, preservation, and conservation of primates. The aim to post current research, news, book reviews, videos, and other forms of media that are related to primates. The CFZ is a blog dedicated to unknown animals, or cryptozoology. It also examines unusual and aberrant animal behavior, animal mutilations, animal colour variants, teratology, and animal folklore. A blog featuring animals of the world and is maintained by Zoological Society of London (ZSL), an international scientific, conservation and educational organization whose mission is to promote and achieve the worldwide conservation of animals and their habitats. Maintained by Lin Kerns, this blog is devoted to the study of penguins past and present. Anole Annals is written and edited by scientists who study Anolis lizards. This blog disseminates new scientific research, natural history anecdotes, and a wide range of other items related to the study of Anolis lizards. Official blog of Journal of Zoology, which publish papers in areas of zoology that are novel and interdisciplinary. It embraces many disciplines including anatomy, behaviour, ecology, physiology, genomics, developmental biology, systematics and genetics, including phylogenetics. Edited by Corinna Downes of Centere for Fortean Zoology, this blog features a lot of materials related to Cryptozoology. Harvey, a zoologist uses this website as a way of keeping up to date with the most interesting discoveries in science and conservation. This blog features some nice articles related to Zoology. Safina, Professor at Stony Brook University, documents the changes occurring in the world’s oceans and the implications of those changes for both animals and humanity.